In an earlier post (Trusting Anonymous Twitter Users) I wrote about how ordinary citizens in Mexico are using Twitter to stay informed about areas of immediate risk in their cities. In our social media research we saw some anonymous Twitter accounts begin to amass large numbers of followers as they gained repute as trusted sources in the dissemination of information related to shootings, explosions and areas of danger in some Mexican cities. If you are not familiar with this earlier blog post you may want to take a look at it since I am about to describe the rest of the story as we discovered and recently published it (The Rise and the Fall of a Citizen Reporter) at the WebScience 2013 conference. While the data and the narrative we presented in the paper “Hiding in Plain Sight: A Tale of Trust and Mistrust Inside a Community of Citizen Reporters” were very interesting, my co-authors and I had the feeling that we had not discovered the full story. For one thing, who really was @GodFather, the person behind the pseudonym we had created for the prominent account in our data? Was it a real person? What if it was merely one of the successful tweet-bots that researchers have launched in the past? Or, maybe it was some guy tweeting from Scotland posing as a young woman living in Mexico. Importantly, what about the accusation that she was not really interested in the well-being of her community, but was instead working for the Zetas, the criminal drug cartel that has been accused of some of the more heinous crimes of the Mexican drug-war. Was there any truth to it? Furthermore, there were several events that we had discovered and had not written in the paper or the blog post. Looking at the aggregate data, my co-author Eni Mustafaraj and I discovered some important developments in the lives of these citizen reporters: Shortly before the accusation against @GodFather appeared, the City had seen a lot of violence and the authorities had failed to act quickly. @GodFather had tried to organize an informant movement of “eagles” (aguilas) on Twitter to report on the actions of the “hawks” (halcones). Hawks is the name given to low-level cartel associates working on street corners using cellphones to communicate with their bosses. These hawks are seen as important actors informing cartels about the movement of the Mexican Army and Navy so they can escape after an attack. Therefore, another distinct possibility was that @GodFather was accused because she was becoming annoying to a specific cartel. 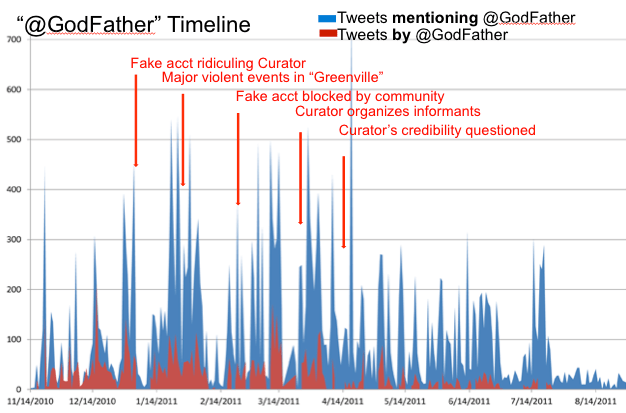 Events in the timeline of @GodFather’s activity in our data indicated a reduction of her activity in early April, 2011. The activity of those mentioning and retweeting her also shows a similar pattern. What was really happening? Was @GodFather one of the prominent citizen reporters informing the people about areas they should avoid on any given day? Was she a traitor working for the Zetas? Or perhaps a fake account? Why was she attacked, and why did she subsequently stop tweeting? Was she still tweeting from another account name or had she disappeared from the community? Another interesting data visualization separating retweets of @GodFather’s messages (in blue) from mentions of her name (in red). While in the first half of the graph her tweets (in green) seem to be echoed by the community, in the second half things change. At that time people are mainly talking about her, not echoing what she tweets. Though we wanted to find out more, our big data analysis was not helping much. We needed verification on the ground. But we could not contact @GodFather directly (we figured that, “Hi, I am a researcher from the US and would like to verify your identity…” would not take us far). We knew that her account had been compromised in the past, so she had every reason to hide her identity. Moreover, there existed several accounts with similar-sounding names, some of them clearly belonging to trolls attacking her, and we did not want to end up talking to them by accident! How could we uncover the truth? The Berkman Center and a measure of good luck helped us make a breakthrough. In July, 2012, the Berkman Center asked my co-author Andrés Monroy-Hernández and me to give a talk (“Narcotweets: Reporting on the Mexican Drug War using Social Media”) on our earlier work. I knew that Berkman talks are advertised, attended and tweeted widely online. Though not very likely, it was possible that some “tuiteros” from Mexico would follow our talk live. If I told them what we had discovered, even using pseudonyms, members of the citizen reporter community would certainly recognize the real identities to which the pseudonyms referred, and perhaps they would be willing to talk to us. Indeed, by the end of the talk (available for viewing), Mariel Garcia, a Berkman intern from Mexico who was tweeting about the talk, showed me a couple of tuiteros accounts that had shown active interest in the talk. They were offering to answer any questions I might have. Of course I jumped on the opportunity; a few hours and many direct messages later I had established connection with one of the prominent citizen reporters of the community. From that citizen reporter Eni and I learned that we had missed an important point in the data analysis. One of the reasons that @GodFather had stopped tweeting was that her anonymity had been compromised in late July, 2011. One of the trolls that had been attacking her throughout the year revealed her real name, her street address, and her picture. Now that we knew where to look, we went back to the data and found the relevant tweets. Her pictures had been deleted on the Web but we were able to look through archives and locate several of them. Now that we knew a lot about Melissa Lotzer, the pseudonym used the by the owner of the @GodFather account, all we needed was a way to contact her. We wanted to interview her about her motives and threats she had received. For reasons that will soon become apparent, we can reveal some details about the community we were studying. Our community of Twitter users is located in Monterrey, Mexico, and they have been using the tag #MTYfollow to stay informed about dangerous situations in their city. The prominent citizen reporter, @trackMTY (aka @GodFather) was owned by a young woman who, like many such reporters, spent many hours a day informing and being informed by her sources. Melissa Lotzer (not her real name, but the one with which she is known in the community) became an active citizen reporter in March 2010, shortly after the #MTYfollow tag was adopted by the community. The drug war had hit the town of Comales, in the neighboring Tamaulipas region, where a drug cartel was reportedly holding some citizens hostage. Melissa and some of her some friends formed a Facebook group, Mexico Nueva Revolucion, and sent an open letter to President Cardenas begging for him to send the Army to free Comales. Following the discussion on various blogs, we see that Melissa and the MNR group received credit for their initiative. But not everyone in the community was happy with these developments; Melissa’s accounts were attacked several times by trolls. But by early 2011, her reputation in the community was strong enough that Twitter shut down some of the trolling accounts after the outcry of the community. Her later initiative to organize the aguilas movement, however, was not as successful. 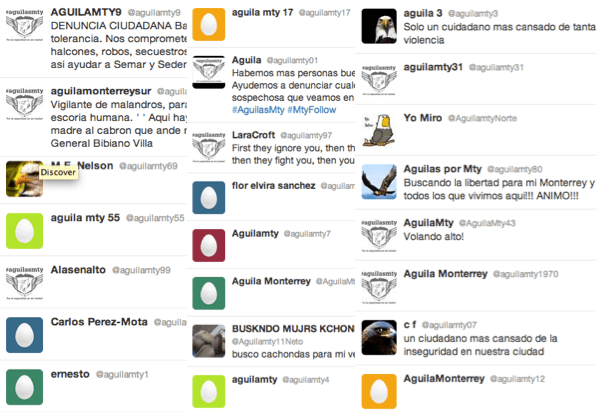 While more than 80 aguilasMTY accounts were created within 2 days (!) ready to support her cause, many of her old friends did not follow her in this movement. Renewed troll attacks and troll collaboration with an editor of the famous Blog del Narco proved to be too strong for Melissa’s reputation to withstand. We connected with Melissa and established a trusted two-way connection. We were able to verify her identity not only from the pointers of other citizen reporters, but also because we could go back and verify her claims through our tweet corpus. You can read more about our interviews with her in the later sections of the paper The Rise and the Fall of a Citizen Reporter, and you can find our slides from the WebScience 2013 talk online. I’m completely sure that trackmty was the reason why many people started using twitter. I receive comments daily by followers that are opening a twitter account to a family member just to follow me […] They tell me: please take care of my mom, she will be reading your tweets, she will not be reporting cases because she doesn’t know how to use a blackberry. Many similar cases like that happen every day. Voice of Melissa Lotzer (@trackMTY) Click the play button to hear. PS. We also found out more about the identity of one of Melissa’s trolls: A young clerk at a local policy station inspired by WWF characters and with a hobby of posting photographs of prostitutes and gays on his blog.